INDIANAPOLIS, Aug. 3, 2017 – A Burmese American Community Institute (BACI) study finds the college going rate among Burmese-Americans 85 percent this year. The researchers at BACI found that the college going rate among the Burmese has increased from 43 percent in 2012 to 85 percent in 2017 which makes a 97.7 percent rise in 6 years. “We are delighted to see the continued rising number of students who are planning to attend college,” said Lian Sang, Director of the Institute’s Upward College Programs that help prepare high school students for their college readiness and success. The study also shows that 169,949 Burmese refugees have been admitted to the United States since 2000. Over 23,000 Burmese individuals reside in Indiana and approximately 17,000 are calling the city of Indianapolis their new home. The overall Burmese population in the U.S. is estimated to be little over 300,000. This figure includes those who came the U.S. before and after 2000 through various paths and it also includes children born in the U.S. The researchers also found that the college persistence rates among the Burmese students have been maintained over 95 percent in the past three years, with of 97.64 percent this year. In his remarks, Mr. Elaisa Vahnie, Executive Director of BACI, said that the community is appreciative of the United States’ commitment to the refugee protection and for the opportunity start new lives in America. He is more optimistic about the future that the U.S. continue to be a beacon of hope for the oppressed as well as for the world’s best and brightest. “As much as we greatly value America’s exceptional leadership, compassion, and rich tradition of welcoming refugees from around the world, we remain committed to collaboratively working with the U.S. Government and our partners to ensure newcomers are becoming economically self-sufficient, integrated through education and employment, and that they are becoming productive citizens.” Vahnie said. “With the leadership and political environment that embraces diversity, fosters common interests with a clear vision, these promising young leaders will be achieving their fullest potential. We will be stronger here locally, nationally, and even back home in Myanmar”, he said. Over 100 key stakeholders as well as elected public officials of Indiana attended the event, including representatives from the Office of U.S. Senator Joe Donnelly and the Office of U.S. Senator Todd Young. Dr. Ro Dinga, chair of BACI, thanked the organization’s supporters and invite the community to continue coming together for the betterment of the society. The research findings and solution-oriented policy recommendations were the culmination of an 8-week intensive Participatory Action Research (PAR) project. These were unveiled at the Institute’s 6th Annual Research Presentation on Tuesday, August 1 in Indianapolis. The research was conducted by forty-seven local Burmese high school students, with the support and close supervision of college, graduate, and doctoral students. The topics of study include: Burmese political participation, health, college persistence, college going rates, cultural integration, and the U.S. refugee admissions program and secondary migration. 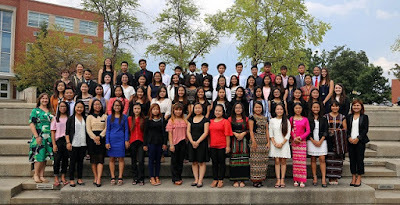 The Burmese American Community Institute is a non-profit organization founded in 2011 that provides educational and vocational support to the Burmese community in greater Indianapolis. The BACI supports community members regionally, nationally, and globally through strategic partnerships and advocacy. Since its inception, the BACI has assisted nearly 5,000 individuals.